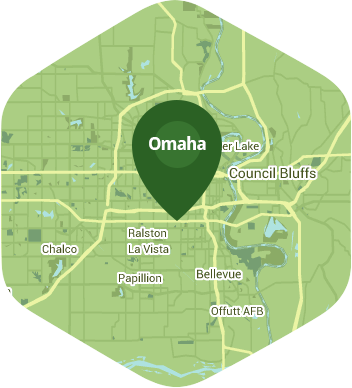 Book a skilled lawn pro in Council Bluffs. Backed by a total satisfaction guarantee and amazing customer support. There's a lot to do in Council Bluffs. With its historical monuments and overlooks, Council Bluffs is a land once looked upon by the likes of Lewis and Clark in their famous journey west. Now, that history lives side by side with modern conveniences in the forms of restaurants, bars, movie theaters, malls and even casinos. Quite simply, there's a lot to do in Council Bluffs and not a lot of spare time to do it all. So, when do you find the time to take care of your lawn? If you have difficulty finding time to dedicate to your lawn, then it's time to call in the pros at Lawn Love. Lawn Love is a fully bonded and insured lawn service company. Our dedicated, skilled and experienced lawn technicians will do all the mowing, seeding, weeding, gardening and clean up your lawn requires. All you have to do is make the first call to let a little Lawn Love into your lawn's life . Call Lawn Love today at 402-413-9143 for a free, fast and easy two-minute quote or check out our online quote tool to get started! He was prompt efficient and called ahead. Thank You! He always does go the extra mile. There is nobody else I would rather have doing my stuff. The yard is COMPLETELY free of leaves! This was our first time paying someone to do our fall cleanup and we will never look back! Thank you so much! Thanks for taking our branches!!!!! Great job! Fast work! Very courteous. Great job in detailing the edges and bring this lawn back to a healthier lush lawn. Chuck has always been friendly. He has provided information on my lawn and some pesky vermin I had under my cement slab. I would recommend Chuck for lawn care anytime. GO CHUCK!!! Continues to look good. Probably one more service, then I should be recovered enough to resume on my own. Charles goes above and beyond! They did an excellent job. My yard was in bad shape, very long grass. They mowed and bagged it all, then weed whipped the whole property. Even got the vines on the fence. Looks good, and appreciate him getting out early to beat the weather. I would like Charles and Doug every week! Excellent job! Cut the grass at a good height--appreciate that. VERY Pleased with how my lawn looked. Looking forward to more service from Charles. Jeff always does a fantastic job. Thank you! Taurus was great. He tamed our lawn and did a fabulous job of ridding it of weeds. Looks great! Very happy. Rated 4.89 / 5 stars in 871 Council Bluffs customer reviews. There won't be any rain in Council Bluffs today, which means you'll probably have to water your lawn. Dusk and dawn are the best times to water your lawn (the sun will rise at 6:40 AM and set at 8:06 PM today in Council Bluffs). Here are some average lawn care prices for homes in Council Bluffs. Average lawn size 3,522 sq. ft.